I have an irrational rational fear of thinks that go bang or could potentially explode. This fear is not limited to Mrs Sensible exploding when she realises I have failed to pay the electric bill on time and ENEL have automatically reduced our available power down to zip, or maybe just enough electricity to power two 60 watt light bulbs. By the way how can they do that? This is Italy it is way too technical for ENEL and besides nothing functions that fast. 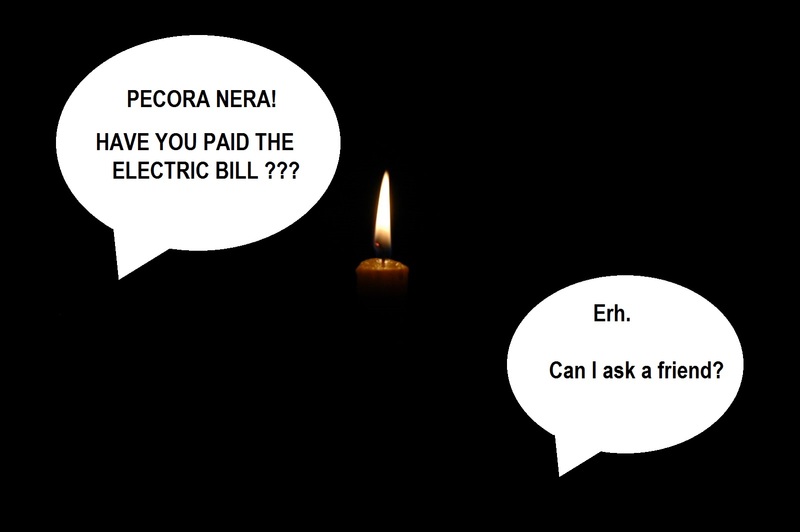 Occasionally I forget to pay the bill before they reduce our power, fortunately Mrs Sensible is only aware of one of these mistakes. This rational fear of things that may spontaneously explode, dates back to a very traumatic life event during my young formative years. 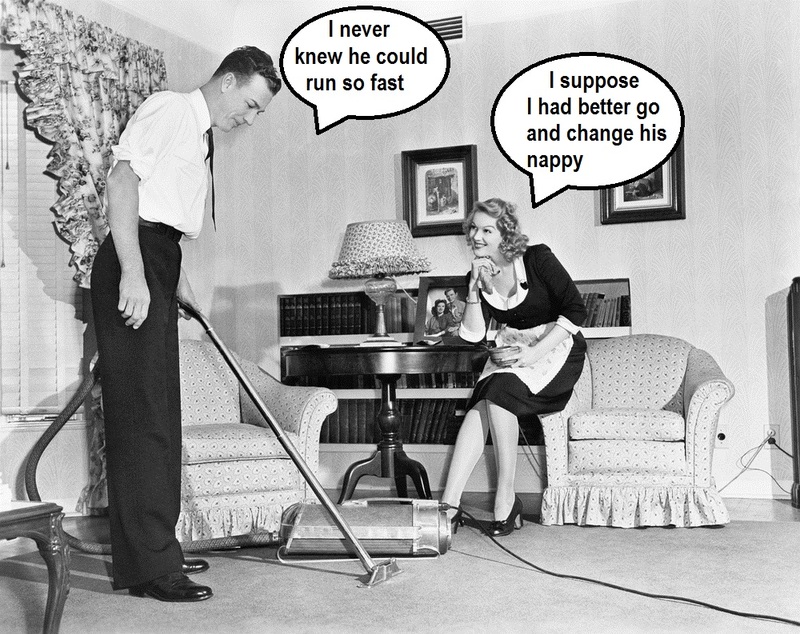 My mother had one of those long tube vacuum cleaners, the ones that mothers drag around behind them. From what I have been told, I decided to sit astride the hoover and pretend I was riding a horse. Everything was fun, until somebody who had a really strange sense of humour decided to find out what would happen if they pressed the big red button and switched it on whilst I was playing my little game. A typical Sunday afternoon when I was a child. From an early age it would appear that I had learnt how to multi-task, I managed to fill a clean nappy, get off the hoover and run screaming from the room quicker that you can shout BOO! I don’t want to thank the person who pressed the red button, but the traumatic experience has in the past, saved me from many injuries. To explain how quickly I can move when startled, let me give you this example: A lunatic of a neighbor who disliked my elder brother, once decided to bang on the roof of my brothers van with a rather large stick. Before my brother had got out of the van to hit him, I had already left the van and sprinted 40 metres up the road and was in a defensive crouch waiting for the (what I thought was exploding van) bits of van to fly overhead. I was 15 at the time. Back to this morning, Mrs Sensible suggested that we start using the central heating for a couple of hours in the morning and a couple of hours in the evening. Using the heating for only 4 hours a day might seem frugal or penny-pinching to you, but in reality it will save us hundreds of Euros. The first winter we lived in Italy we heated the house the same way we did in the UK and our ENEL November / December gas bill was for over nine hundred euros! and that was a little efficient combi-boiler not the monstrous beast we have in this house. To give you an idea of its size, look at the stack of garden chairs next to it. We think this boiler was either army surplus of was previously used to heat the Casale Monferrato hospital and the ambulance station next door to it. When the boiler starts, it sounds like a jet engine ready for take off, I cry as I can hear hundreds of euros of gas being sucked into it. Now this boiler has sat dormant for the past eight months and this morning I attempted to light it. Last year the electrical control panel for the boiler was upgraded, previously it had lots of bakelite switches and levers that looked like Frankenstein’s life support system. This morning I flipped the main electrical switch and turned on the pump controls, set the clock to on and waited. It normally takes 15 seconds to ignite and start burning my Euros; nothing it didn’t even fart. I then remembered I needed to go outside and turn on the big gas valve. I repeated the process and after 15 seconds it hummed, whooshed and burst into action, Whoo hoo! I was just sending Mrs S a whatsapp message when it shut down. So I rang Francois our boiler expert and left him a garbled message. Something like “I Englishman, please boiler kaput fix today?” As I hung up and wondered if I could have phrased my request any better, I decided to try a little DIY. I swiveled the weird divertor valve, unscrewed pumps 2 & 3 then remembered to turn off the gas and electric. Both pumps had seized, so I gave them a technical tap with my hammer, swore at them, reassembled and turned on the gas and electric. The pumps started turning, so I lite the boiler and retreated to a safe place. It whooshed farted and stopped. So I phoned François again and left him another totally bizarre message. He probably plays my messages to his friends while they are getting drunk on grappa. I then remembered the special reset button at the front of the boiler, so I pressed it for 10 seconds and quickly retreated outside my persevered blast radius. It hummed, farted once again and burst into life. I carefully replaced the cover, I have to be honest I don’t like or trust this ancient machine and my natural flight response was screaming in my head. 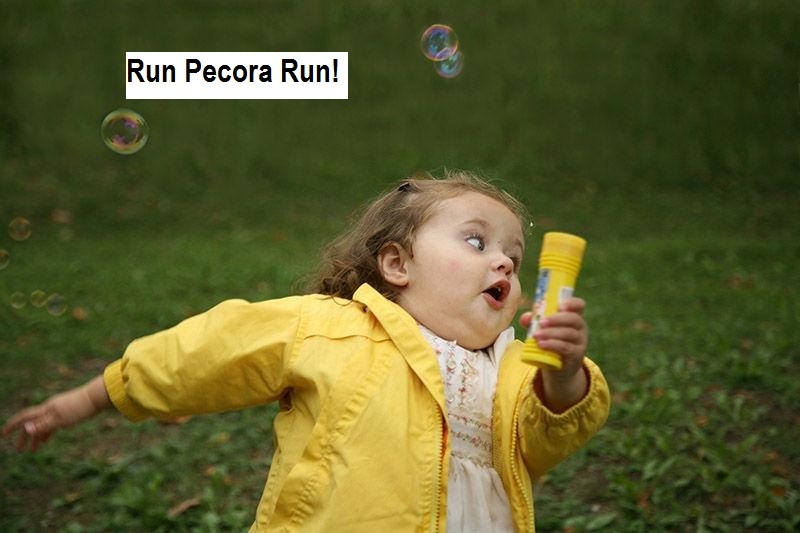 RUN! It still might go BANG. Happy December to you all. ← Winter is nearly here! Oh can I relate!! I am terrified of our boiler and dread the winter when I must purge the water from it and refill. I too feel at any minute it could explode unexpectedly. Grateful for the heat it provides, but fearful of it just the same!! 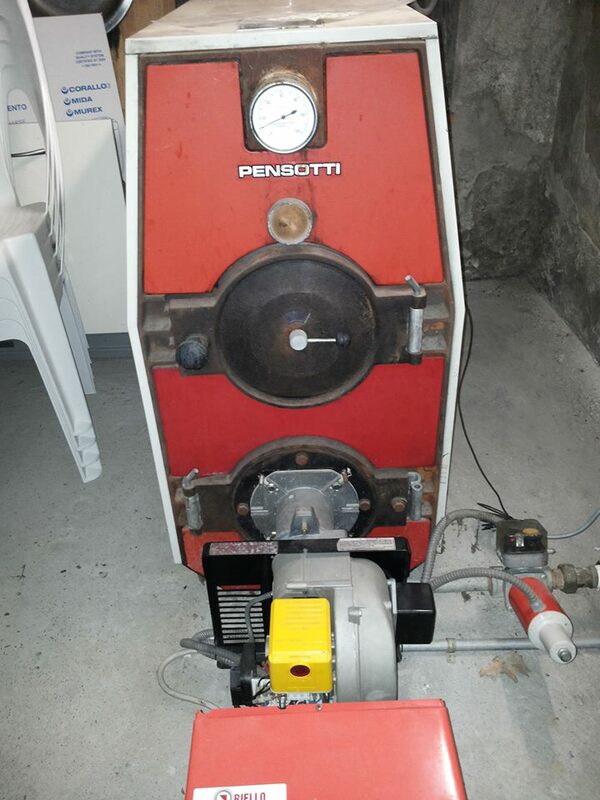 Boilers are so expensive to run in Italy, this boiler was originally oil fired and the previous owner converted it to gas.. The pipes look like spaghetti and the heating guy just scratches his head and looks at it when he arrives. Oh, boy, I’m scared of what the ENEl electricity and gas bill will be when I pay up before leaving Venice. I keep the heat very low, but you can hear ‘slurp, slurp’ as the caldaia guzzles gas. Then, there is a separate electric water heater for the kitchen and one for the bathroom. I’m learning to love cold showers. Hi Yvonne, It doesn’t help having cold tiled floors. They are great in the summer but I would love thick carpets in the winter. you need rug slippers, I believe it’s possible to make cosy ones with cat fur ? I could make some matching gloves and a Davy Crockett hat with the number of cats we have at the moment. 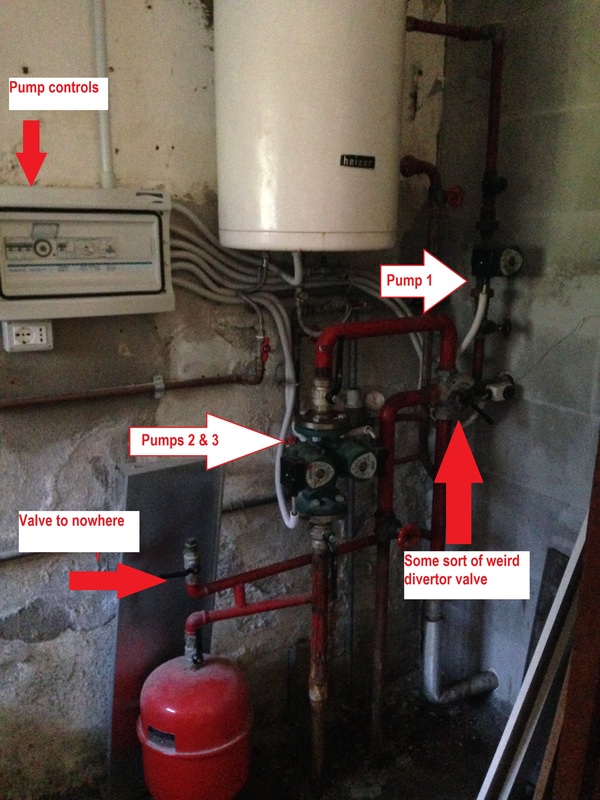 You have a state of the art boiler – don’t complain… when I was young in Torino we had a small mechanical gas boiler hung on the wall above the tub in the bathroom. One had to light it with a match properly applied to a gas line properly adjusted. When all was adjusted properly it went something like a Ferrari, taking off whoosh-roar, and the cold pipes banged at the sudden flare of gas – when all was safe we waited for the water to pour warm/hot in the sink or tub… The kitchen was not hooked up so we had only cold water there but the sink itself was marble, like the table itself. This was NOT in the 18th century but in the 60 and 70s. I see that things have progressed indeed, but only a little, if boilers are still manual and only a courageous home owner can dare to light one. eh eh! but the wine and the agnolotti make up for it, no? happy Winter, happy holidays, may Gesu’ Bambino bring you all that your heart desires. 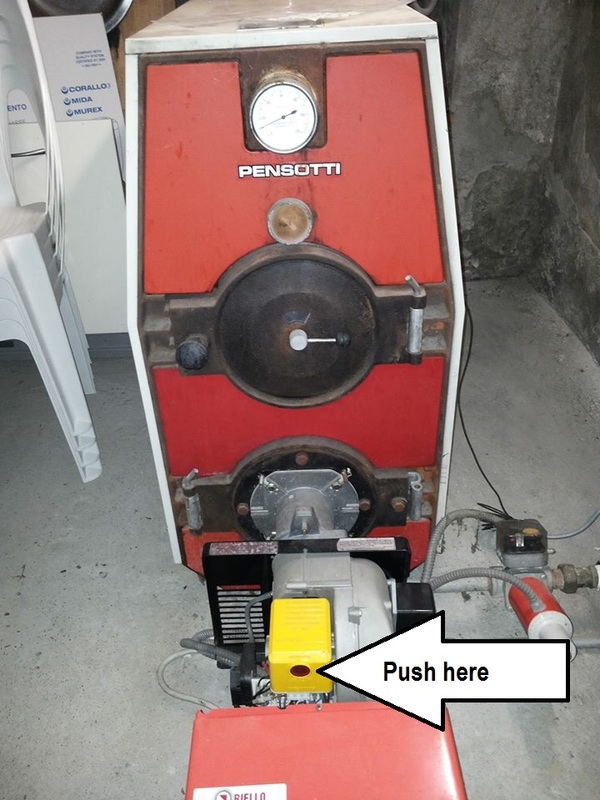 Ciao, V.
I am not sure it is a state of the art boiler 😉 It works in a fashion but it is very uneconomical and temperamental. In our old house, we had a solar heating system whose flapping ducts, hissing baffles, and droning fans worked with electricity – sorry COP21. We never did figure out the mystery of it, so we called it The Solar System. We moved to a house high in the Colorado mountains that was heated with a wood stove (I related to your earlier post), but every other person’s woodsmoke in the town settled on our house. My doc told me that if I didn’t want to be one of those people in Walmart dragging an oxygen tank, we needed to move. We now live lower in the same mountains, so far out in the woods that no one’s smoke gets near us. Do you have a problem with woodsmoke in your town? We are lucky, we live in the middle of the vineyards on an isolated road with only two other houses. Only the house further down the road burns wood so we don’t notice it. However we used to live in a little village and I am sure in the winter 85% of them burned wood. The smoke mixed with the incredible fog we get here produced thick smog. Worse than anything I saw in the UK prior to them banning coal etc. We nearly moved into a house that hat a huge diesel boiler that heater the house via air vents….. Diesel powered hair dryer!! 🙂 I loved the house but Mrs S vetoed it because of the heating. Ah, the smell of diesel in the morning… makes me think of London… like the smell of gingerbread makes one think of Christmas. Happy Christmas to you both! And a Merry Christmas to you as well. Your writing makes me laugh – always a great way to start the day. I’m in shock at the heating prices! So, do all Italians just huddle together through the winter and hope for spring?! Gas is so expensive, I thought it was an estimate, when I checked the reading we were already far above their reading. That’s when we obtained a mini wood burning cooker and stuck it in the lounge! i can so identify with this, the explosion potential, the lighting of things, how they work, what not to connect, etc. – it is all very frightening and mystical to me. if i don’t have someone to help me with these things, i cross my fingers, close my eyes and run. Our boiler (oil) stopped working last winter and we had to call someone into fix it. I tried to make it work myself but my wife made me stop when it started releasing clouds of black smoke when I tried to restart it for the third time! I sympathise with your boiler fears! No boiler here, just a log fire to feed on a regular basis. Papounet fitted the boiler at his hose: the tubes going in and out look like spaghetti junction, and it took me ages to get the thing started last year. I was standing well back whilst reading this post and looking at the boiler photos – just in case! Very wise, as I lit the boiler I cursed my fate for being born with normal length arms. I really could have done with them being just a bit longer. Or if I had been born with 3 arms, I could have stuck a finger in both ears when I lit the boiler instead of only one ear. I think longer arms (or three of them) would help a little, but ideally I’d prefer to be in a different room (or building) altogether! I had one of these in Denmark, it used diesel and were very expensive in use. 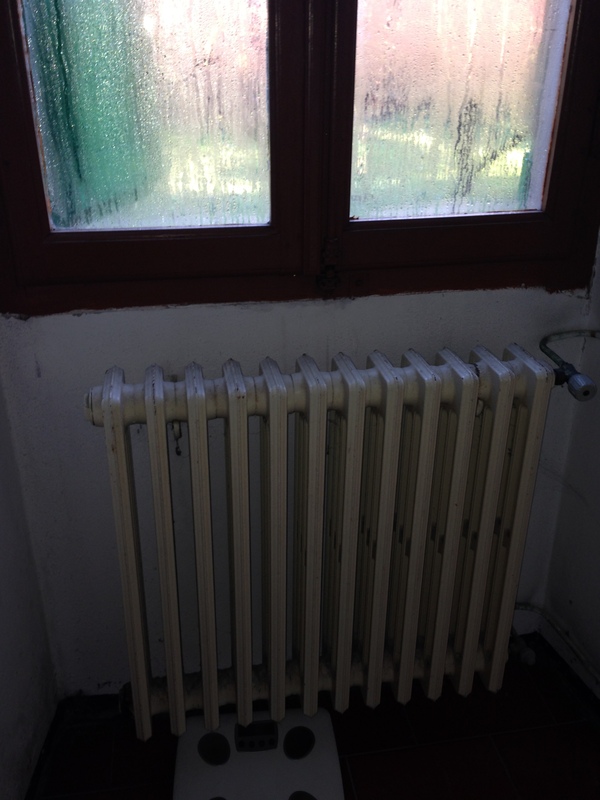 Here in Spain I have electrical heater and holes around windows and doors, fresh air you know. I’m looking very much forward to the Spring, electricity is very expensive too. Allora! Buon Natale a voi, and practice those gli sounds faithfully! I had a similar experience in my flat the other day. In the shower, washing the hair dye out (very important!) and it suddenly runs very cold. I don’t have the best relationship with my shower so cue the effing and blinding. Hope out and check the other taps in the flat. All freezing cold. Great – it’s midnight. What the hell do I do now? Start whatsapping my family and friends. Panicking because, like you, I always pay my bills late. Sending pictures. Dad says the pilot light has probably gone out. Clamber onto a chair to see if there’s a flame. Nothing. Okay, so this is probably the problem. Now what? My dad’s advice – find the reset button. Nothing on the damn thing looks like a button. So I just start poking everything and eventually come across a button disguised as a light. Hoorah! Problem solved! Hope back in the shower and curse the Italian who installed a boiler that doesn’t have an obvious reset button. Oh, Italy.